Vinyl, wipe clean, easy attachment to bed rail pads. 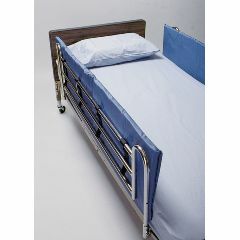 AllegroMedical.com presents The Vinyl Bed Rail Pads. Vinyl, wipe clean, easy attachment to bed rail pads. 60"L x 1" thick, 15" height. Provides maximum bed-rail cushioning. Extends below and between the rail and mattress for added resident protection.